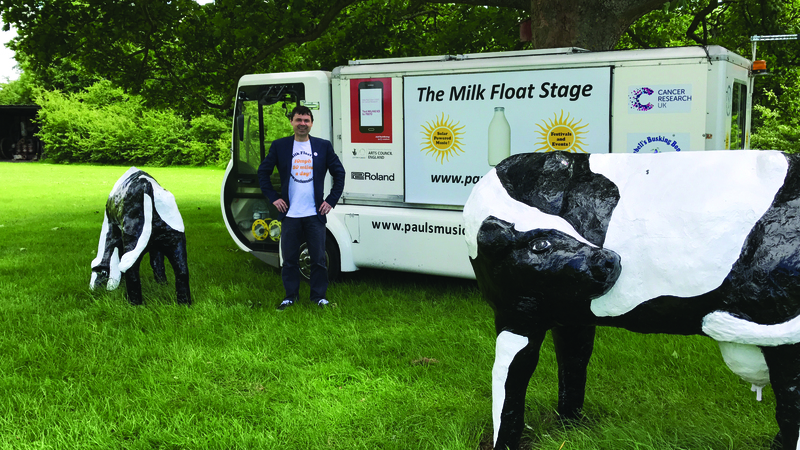 Paul Thompson and his converted milk float, Bluebell, are well on their way to Cornwall on their charity busking bonanza. The Sheringham-based singer/songwriter is driving the souped-up vehicle all the way to Land’s End and said he has already raised more than £1,500 towards his £5,000 target for Cancer Research. “The highlights have included stopping to do an interview and play a song on Cambridge 105 (I played a song I’d written in memory of my dad and made the presenter cry on-air!) 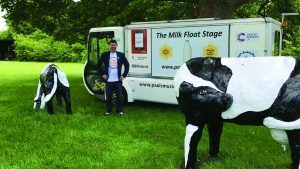 and performing to a group of schoolchildren in front of the famous Milton Keynes cow statues,” he said. Other special moments included a street party in Stroud organised by a music promoter, which raised £350, and an all-day event the following day, when he was joined by some talented singer-songwriters from the Stroud area. Arriving in Glastonbury for the solstice, he performed in the town and was en route to the Dorset Midsummer Festival – involving the biggest hills of the tour so far. “I’ve also heard from Tate St Ives that they’d like me to do an event with Bluebell, which gives a great focus for me reaching Land’s End,” he said. Anyone wanting to follow Bluebell’s route can visit www.paulsmusic.co.uk for his blog and keep up with live updates on Facebook and Twitter. Donations can be made at http://www.justgiving.com/fundraising/paulsmusic. This entry was posted in Home Page, Sheringham and tagged busking, Charity, Holt, milkfloat, Sheringham on June 28, 2017 by Gay Webster.